Use ColorJet™ III to decorate t-shirts with your water-based/pigmented desktop inkjet printer! ColorJet™ III is an opaque white material with a matte finish, coated for water-based inkjet printing. Use inkjet “print and cut system” or cut by hand. You can apply ColorJet™ III with heated hand iron and firm downward pressure. Make sure that the print is thoroughly dry before pressing! One-step printing for light colored fabrics. When printing, reverse the design and then the carrier becomes the transfer mask when heat-pressing! When heat-activated, this material becomes clear. Now for dark fabrics. This is an opaque material, so be sure to print the design ‘right-reading’ and then use a transfer mask to lift from the carrier before pressing. We recommend our DTM-855. 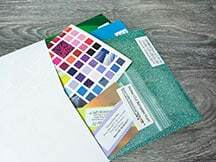 Both products are available in packages of 8½” x 11″ and 11″ x 17″ sheets for easy use with desktop inkjet printers. Pressure – Very firm, even. Lint roll garment before pressing. Special Precautions for both CJ3 for Light & Dark: Make sure that the print is thoroughly dry before masking or pressing. Do not stretch or cracking will occur. For Light CJ3-2185: Before pressing, use a lint roller to remove any dust or fibers on the garment.